The difference between the warming at the end of the last ice age (left side of the graph) and the current warming (right side of the graph) demonstrates how truly abnormal the current change in climate really is. In the article in science A Reconstruction of Regional and Global Temperature for the Past 11,300 Years the authors took 73 proxy records of temperature, including isotope ratios and pollen records in order to construct a global temperature record for the entire Holocene period. 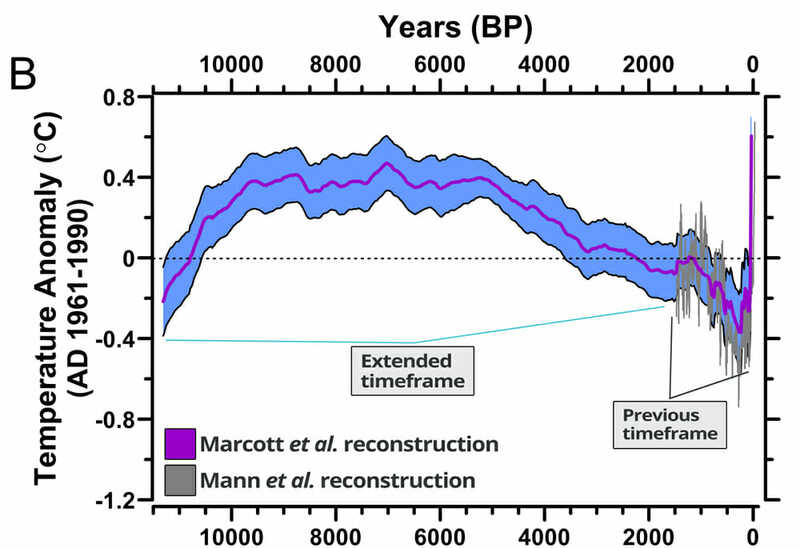 The reconstruction shows warming as we exit the last ice age, followed by a stable temperature plateau, followed by about 5000 years of gradual cooling ending around the beginning of the last century. The decade of 1900-1909 was colder than about 95% of all other decades in the Holocene. But since then there has been rapid, unprecedented, warming so that by the end of the most recent decade (2000-2009) temperatures were warmer than about 82% of all decades in the past 12,000 years. In 100 years we have undone 5000 years of natural cooling! This reconstruction fits nicely with what we already know (especially for the past 2000 years) and doesn’t really change the big picture, it just adds some details. This gives us confidence that these results will withstand the inevitable post publication scrutiny. I think there is something to Rohde’s concern. It is possible than a century long blip in temperature might not show up in this reconstruction so in some way we are limited in how we compare this reconstruction to the past 100 years of warming. However we know with a lot of certainty that our current warming trend is not just a blip. Since the CO2 we have emitted into the atmosphere is going to stay there for a very long time the current change in temperature will be much longer than a simple blip. And were something similar to have happened in the Holocene this reconstructions would have very likely picked it up. 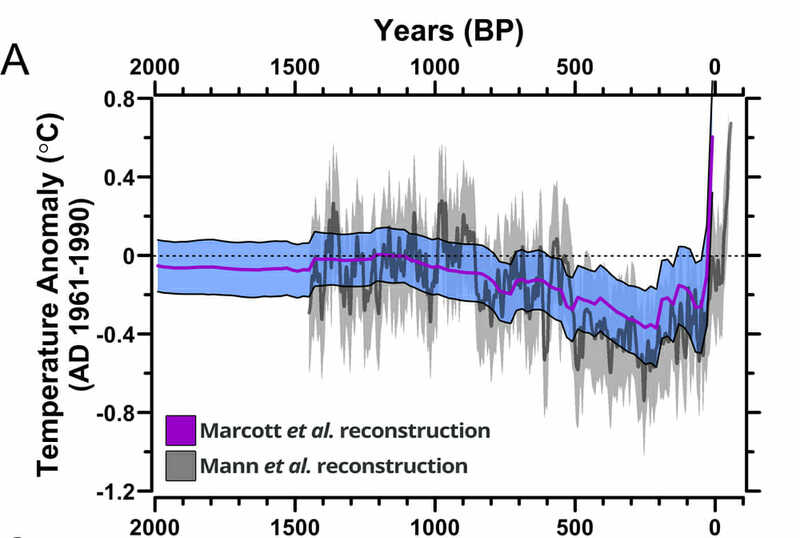 So while this reconstruction indicates that current temperatures are still slightly cooler than the Holocene climatic optimum (this isn’t anything new) there is reason to think that this might represent a bias in the data and not reality. It would not be surprising to learn that current temperatures are higher than anytime in the past 125,000 years. Regardless, if we aren’t yet warmer now than in the past 125,000 years then our current temperature trajectory means that we will get there before too long. Lastly one of the most important features in the reconstruction is the difference between the warming at the end of the last ice age (left side of the graph) and the current warming (right side of the graph). It demonstrates how truly abnormal the current change in climate really is. What matters more than how much climate changes, is how fast it changes. If it changes slowly, then human society and natural ecosystems (and everything in between) will have a much easier time adapting. If, on the other hand, the change is quick (as the reconstruction shows that it has been) then adaptation becomes much more difficult and suffering becomes inevitable. But quick change seems to be where we are headed, and we are doing little to mitigate that change. We might be able to adapt to it, but we wont be able to avoid suffering. That is the path our inaction is leading us towards. It isn’t the path I want to be on. We ought to be outraged! “about 1200 years” should be “about 12000 years”? you will always get an exaggerated movement when you change the scale, in that graph the large movements are filtered out to give a mean,the last movements havenot been averaged there will be many such spikes (up and down)that have been filtered out. And, in the first sentence, referring to the Holocene, s/end/start/. It has hit a raw nerve with the “usual suspects.” Morano and Goddard have wasted no time in their typical hurling of insults. It’s amazing to me that Morano sees fit to rely on Goddard as a quotable expert. Based on both of them having it as headline material to (in their way) discredit, I give it high credibility sight unseen. Morano’s spinning so hard he is making me dizzy. If the stakes weren’t so high I would be laughing. > Brave but foolhardy to stand for a losing cause. Mike, Joe, Al Gore, anybody else left out there to continue your losing debates? If so, let’s at least make some interesting side wagers on outcomes. Apparently Marcott is now being accused of puslishing a paper with results that are not in this 2011 PhD thesis. Bizarre. Has the kitchen sink been thrown at Marcott yet? Andrew Sullivan gets it – that’s almost mainstream.